Also known as Saint Edward the Confessor, was among the last Anglo-Saxon kings of England. Usually considered the last king of the House of Wessex, he ruled from 1042 to 1066. The son of Æthelred the Unready and Emma of Normandy, Edward succeeded Cnut the Great’s son – and his own half-brother – Harthacnut, restoring the rule of the House of Wessex after the period of Danish rule since Cnut (better known as Canute) conquered England in 1016. In 1041 Harthacnut invited long-exiled Edward back to England, probably as heir because he knew he had not long to live. 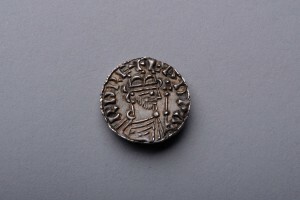 The 12th century Quadripartitus states that he was recalled by the intervention of Bishop Ælfwine of Winchester and Earl Godwin. Edward met “the thegns of all England” at Hursteshever, probably modern Hurst Spit opposite the Isle of Wight. There he was received as king in return for his oath that he would continue the laws of Cnut. 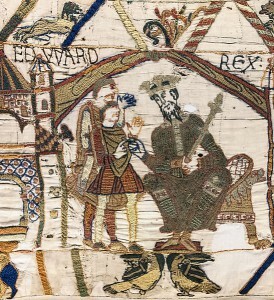 According to the Anglo-Saxon Chronicle Edward was sworn in as king alongside Harthacnut, but a diploma issued by Harthacnut in 1042 describes him as the king’s brother. Following Harthacnut’s death on 8 June 1042, Godwin, the most powerful of the English earls, supported Edward, who succeeded to the throne. The Anglo-Saxon Chronicle describes the popularity he enjoyed at his accession – “before he [Harthacnut] was buried, all the people chose Edward as king in London.” Edward was crowned at the cathedral of Winchester, the royal seat of the West Saxons, on 3 April 1043.